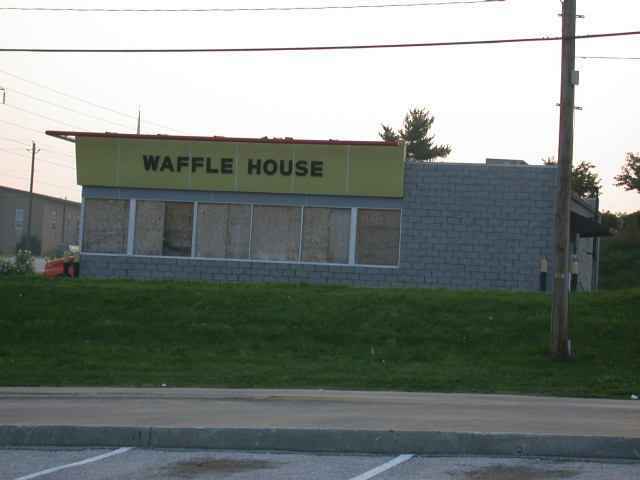 What could be sadder than a boarded-up Waffle House? 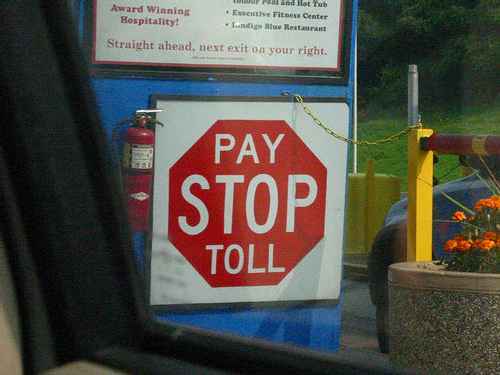 Seen on the Pennsylvania Turnpike: “Pay Stop Toll?” What does that mean? Maybe we should have picked the first or second itinerary options, because then we would have beat the Pennsylvania Turnpike toll increase that takes effect Sunday. But at least we’re not going to be driving a vehicle weighing 100,001 pounds or more! I think our Pennsylvania Turnpike toll is going to be $16.25; the heaviest of trucks would pay $636.00 between the same two interchanges. Actually, based on my previous experiences, if that toll rate keeps a few trucks off the turnpike, it’s good, because driving between Philadelphia and Pittsburgh gets very tedious when you’re having to pass hundreds of trucks that are going very slowly up the hills. 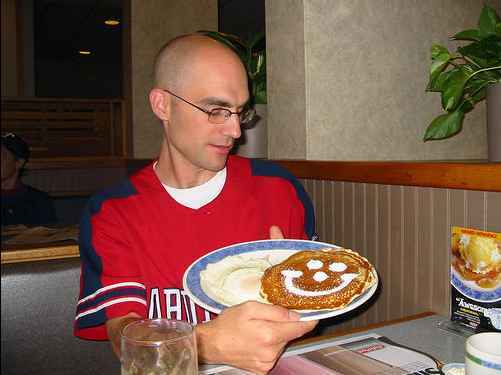 Jim: What was then a $6.50 toll (from the Ohio state line to Breezewood) is now $9.50. I guess I can’t compare the I-79/I-68 routing to Three Rivers Stadium anymore, since I-79 and I-68 are still in existence. Perhaps someday they will be replaced by or supplemented with high-speed railroad corridors, which I will then be able to compare to PNC Park. Levi: If all goes well, I’ll next weekend (at my brother’s wedding) be getting my sister’s extra iPod (She got one, then her husband won one), passing mine along to Stacey, who has less need for thousands of songs at her fingertips daily. I don’t know how big this one is, but it’s bigger than my 5-gig one, that’s for sure. Jim: Won one by buying the 97,600,000th song (or whatever) from the iTunes Music Store? If so, awesome! If not, slightly less awesome, but still awesome! I can’t even remember now how many total songs I won from Pepsi bottlecaps. If it’s a third-generation iPod, it’ll work with the car charger I’m bringing, so there will be no need to worry about having to charge up the battery in order to listen to Jack Benny. Posted on July 31, 2004 April 8, 2010 Author Jim EllwangerCategories brpa, planning, road tripTags pennsylvania turnpikeLeave a comment on Piked!